Xiaomi is working on another mid range device and named it as “Ferrari” which has just come up in the benchmark listing site where we can check the specifications of the device as well unofficially. 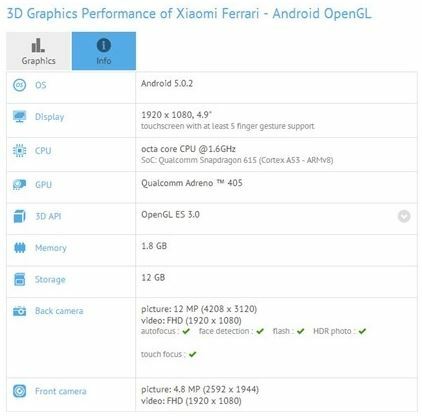 The specifications and features of Xiaomi Ferrari have been shown in the image below from the benchmark listing site. the launch name will not be Ferrari as the devices are mentioned in the listings with code names. The device is having some amazing features but it is not clear why it is being named ferrari which is a super in the cars market but the features of this device seem to be in the mid range category. Coming to the features and specifications of the Xiaomi Ferrari, it comes with a 4.9 inch Full HD display with 1920 x 1080 pixels resolution having touchscreen with at least 5 finger gesture support. The device is powered by Qualcomm Octa Core 1.6 GHz Snapdragon 615 processor and Adreno 405 GPU which is supported by 2GB (given as 1.8Gb in the listing) of RAM. The internal memory is shown as 12GB in the listing which is actually 16GB without the OS files. It runs on Android Lollipop 5.0.2 out of the box and the camera is a 13MP Rear or primary camera with LED flash and a 5MP front facing camera which are mentioned as 12MP and 4.8MP in the listing which are the precise values mentioned. The Video recording is Full HD where 1920 x 1080 pixels resolution videos can be captured with the rear and the front facing camera. Image resolution of the 13MP rear facing camera is 4208 x 3120 and the 5MP front camera is 2592 x 1944. Lets hope that the device being launched is the Ferrari of the mid-range smartphone segment and with the 4.9 inch screen size with the Full HD display the device is going to be crisp and hope that the design is also as good looking as the Ferrari’s of the Auto mobile world.